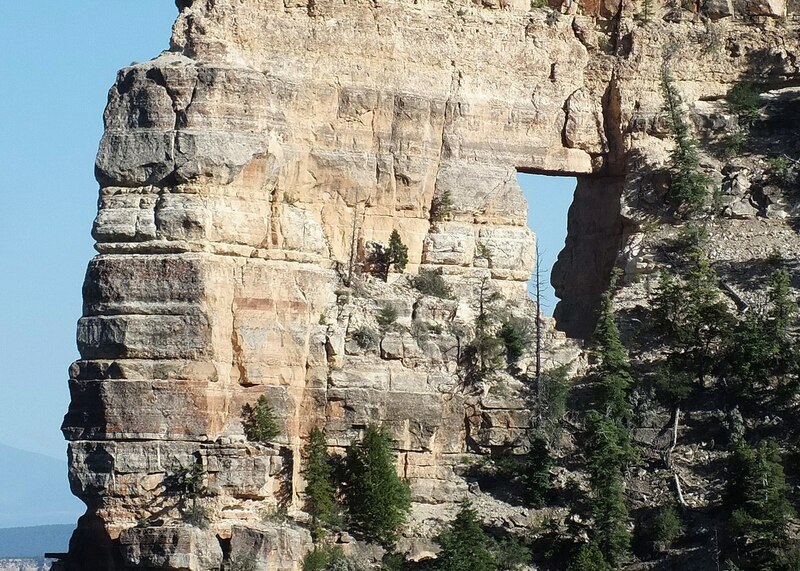 About mid-morning one day, as we traveled along the South Rim of the Grand Canyon National Park, Bob and I decided to take a drive over to the North Rim since a couple of highly touted unique features, one being Angel’s Window, are situated on that side of the sprawling gorge. Our progress took longer than expected because of frequent stops to admire the scenery. 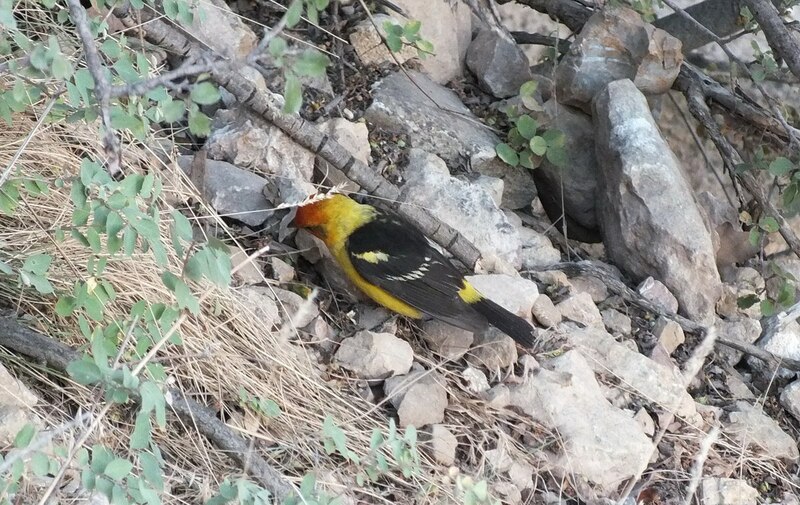 Finally at our destination, we hastened to take in the views, but were brought up short by the unexpected sighting of a Western Tanager (Piranga ludoviciana) at Cape Royal. 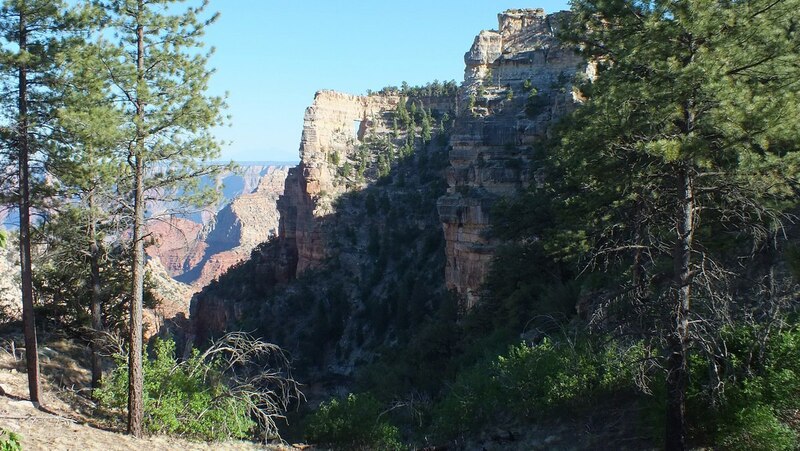 The North Rim of the canyon actually sits 1,000 feet higher than the South Rim, and some people feel that the most impressive sights are to be seen on the north side. The distance to get there was a whopping 200 miles or so. 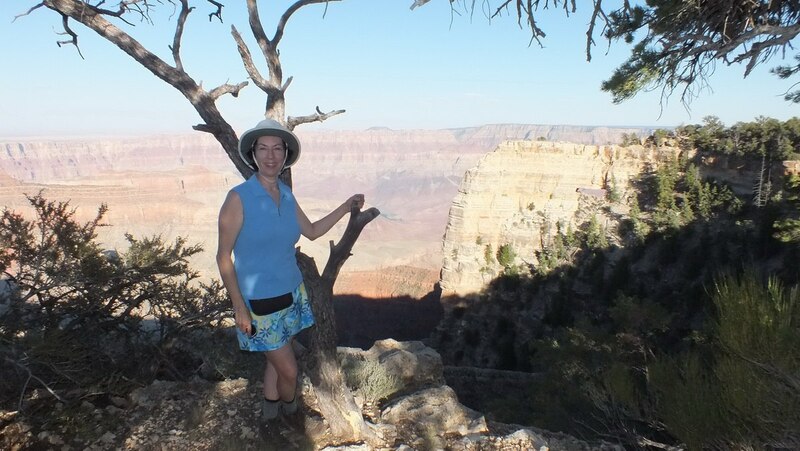 At Cape Royal, we had a view of Angel’s Window from two vantage points as a series of trails led us to first one, then the other side of that famous hole in the wall. Our timing was good because, at 4:30 p.m., the late afternoon sunshine cast dramatic lighting on all the topography and made for good photographs. 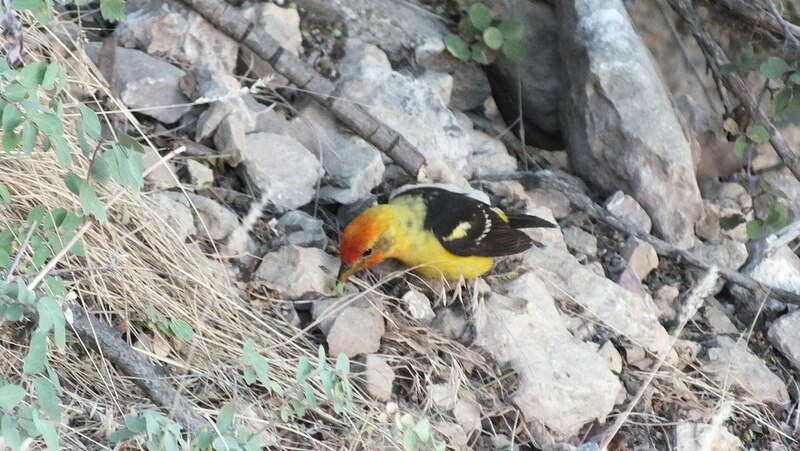 It was as we made our way from the eastern view of Angel’s Window to the western view of that same feature that we came upon a Western Tanager foraging for seeds or insects amongst the rocky debris. 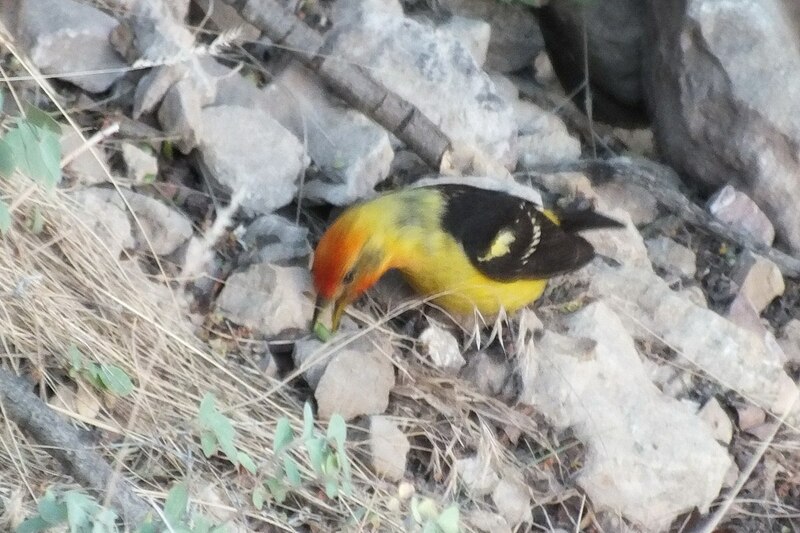 Western Tanagers are found primarily in moderately open coniferous forests and mixed woodlands during breeding season. 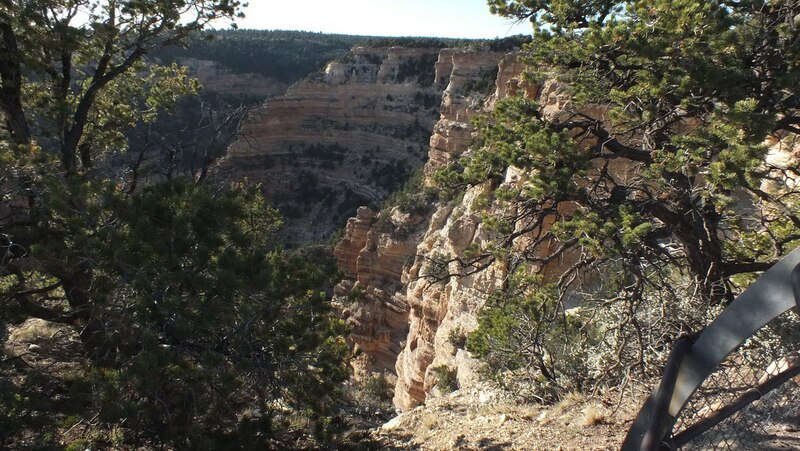 It is a common summer species of the pine forests found along the Grand Canyon. Western Tanagers most often feed on insects high in the trees where they remain quite inconspicuous despite their brightly coloured plumage. It is this coloration that led to these tanagers being classified as members of the cardinal family (Cardinalidae), rather than the tanager family (Thraupidae). This breeding male loses the red colouring of the head once breeding season is over. The red pigment of the face is actually acquired from the bird’s diet, from insects that have acquired the red pigment, rhodoxanthin, from plants. 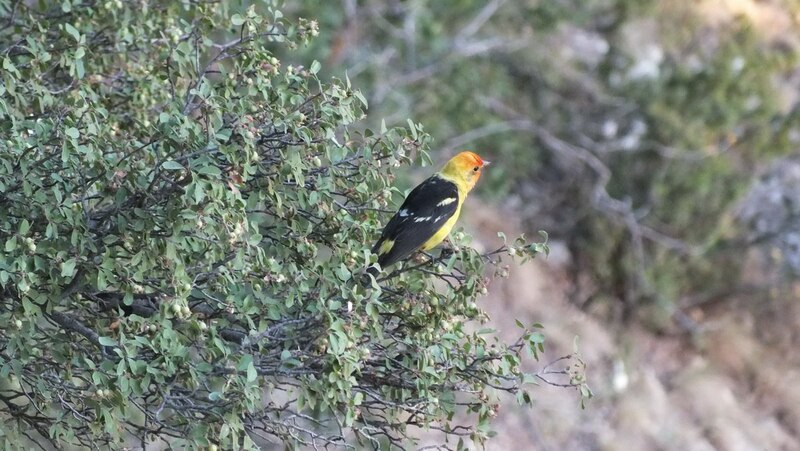 In late spring and the early part of summer, Western Tanagers feed on insects, sometimes behaving more like a flycatcher in the canopy of trees, but then they move to eating berries and other small fruits. 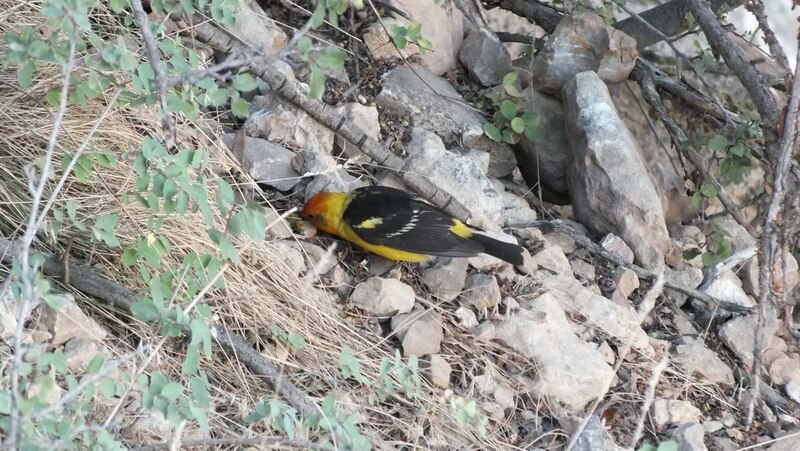 It is hard to tell, in this photo, what the tanager has managed to find, but I suspect that it is a caterpillar. 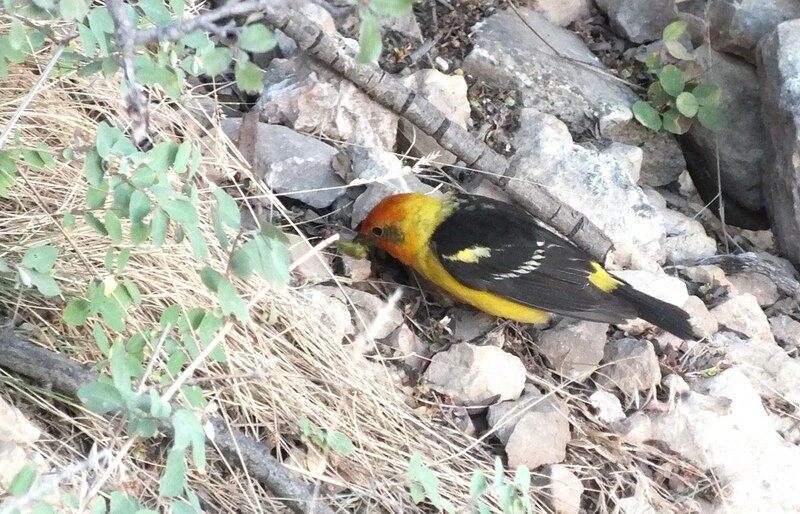 Western Tanagers breed in forests all along the western coast of North America, from northern Baja California to southeastern Alaska. How shocked we were, then, to learn of a sighting of a Western Tanager this past August at Hamilton’s Cootes Paradise swamp, right here in southern Ontario, smack dab in central Canada. That sighting, some say, may be due to the impact of climate change and the massive storms that have blown across North America this past summer. 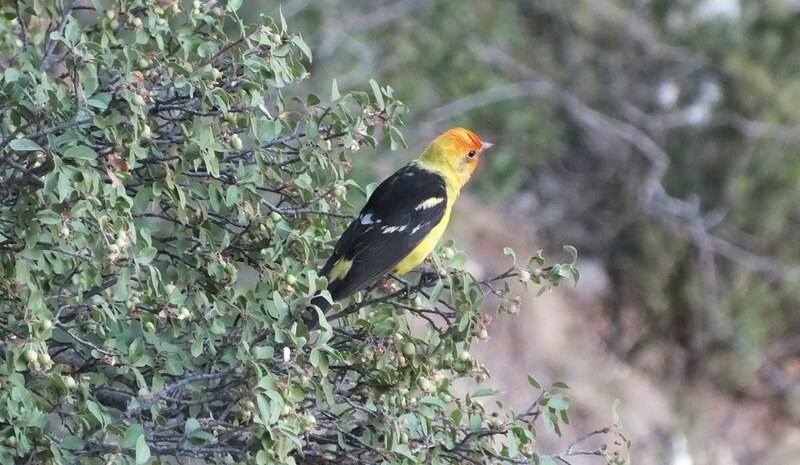 End result – a Western Tanager got lost during migration and landed up in a swamp in Ontario.